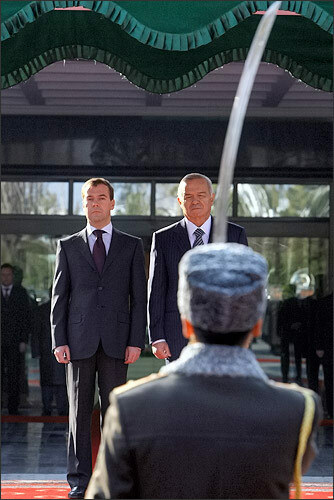 President of Russia Dmitry Medvedev's latest visit to Uzbekistan was unique on many scores. It took place when a new US Administration was being installed in Washington, one with which official Tashkent had to establish contacts yet. It is common knowledge that a great deal in the future Uzbek-American relations depends on the US Department of State and its stand on some sensitive issues. This stand accounted for a lot of bad feelings between Tashkent and Washington in the past. Tashkent shifted an emphasis from Moscow to Washington and back more than once over years. Considering the recently mouthed words of friendship, specialists cannot help wondering what helped restore Russia's trust in one of the most difficult partners in Central Asia. 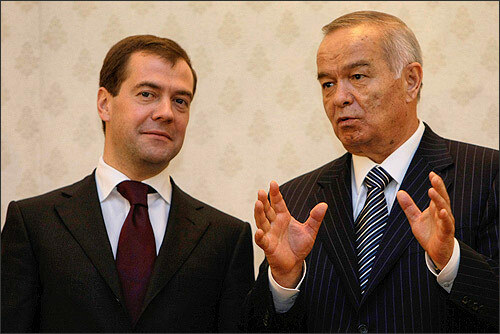 Certain events and developments accounted for Uzbekistan's return into the Russian political orbit. At first sight, all advantages gained during Vladimir Putin's presidency seemed to start evaporating with the new president of Russia in place. Tashkent proclaimed the intention to quit the Eurasian Economic Cooperation Organization last autumn, roughly when the European Union relaxed the sanctions imposed after the tragedy in Andijan. "Tashkent Goes West" and its equivalents became headlines in the Russian media prognosticating a change in Uzbekistan's foreign policy. President Islam Karimov apparently disagreed with these assumptions. His Russian opposite number's visit was extremely "opportune" which was hardly surprising considering that it was Tashkent that had insisted on receiving Medvedev in 2009 and not during his future Central Asian tour. As matters stand, the visit was ceremonial (no wonder, considering the highest possible status of the visit) and at the same time informal (when in Samarkand). The meeting did demonstrate exclusive nature of the Russian-Uzbek relations, just as organizers of the visit had intended. Importance of the power agreements made during the visit cannot be overestimated. Uzbekistan promised Gazprom 15 billion cubic meters of gas additionally. Annual production in Uzbekistan is estimated at 65 billion cubic meters, 16 of them exported north, 4 to neighbors, and the rest used domestically. The additional volume promised Gazprom will probably be subtracted from what Tashkent has been exporting to Kyrgyzstan and Tajikistan (unable to meet the rising prices, these countries reduced import from Uzbekistan). LUKOIL is expected to play a major part in the planned increase of export to Russia. The head of LUKOIL Vagit Alekperov was granted an audience with Karimov a day before Medvedev's visit. He told reporters afterwards that LUKOIL intended to invest $5 billion in the Uzbek power industry. Aleksei Miller of Gazprom made headlines proclaiming that the involved parties had decided to build a new gas-mains, one that would boost the running capacity of the existing Central Asia - Center gas pipeline. Considering that the recent Russian-Ukrainian gas conflict convinced the Europeans (and the Americans too) of the necessity of alternate power suppliers, this piece of news is of paramount importance. The future of Nabucco will be on the agenda of the summit scheduled to take place in Budapest, Hungary, in late January. Alexander Rahr, Director of Russian Programs of the German Foreign Policy Council, is convinced that the West will pull every string and call every debt to induce Central Asian countries to join this project. The German expert told Gazeta that the situation being what it is, it is of vital importance for Russia to beat the Western community with construction of its own gas pipeline. Gazprom took a major step forward, a step closer to this objective. The matter concerns construction of the Caspian Gas Pipeline whose project Moscow adopted together with Kazakhstan and Turkmenistan during Putin's presidency. Uzbekistan, the country that was to provide its territory for construction of the gas pipeline, made a point to ignore the project. Putin visited Tashkent last September and the meeting with seemed to remedy this situation. The Uzbek president met the visiting Russian premier right at the airport and the outcome of the visit matched the cordial welcome. Joint work on development of a new gas pipeline framework was proclaimed ("... to enhance export capacities of Uzbekistan and Turkmenistan"). "We share a common interest in the project," Putin said. Withdrawal of Uzbekistan from the Eurasian Economic Cooperation Organization caused another pause in the bilateral relations shortly afterwards and compromised the project. Karimov refused all high-level contacts and even ignored an invitation to the informal summit of the CIS Collective Security Treaty Organization in Kazakhstan. Gas pipeline agreements are proclaimed again now, and with pomp. Uzbekistan's motives would have been hard to discern without recollection of a certain old and knotty conflict. With the population standing at 27 million and mostly involved in agriculture, Uzbekistan cannot help assigning the highest possible priority to the problem of water supply. Kyrgyzstan and Tajikistan, countries located above Uzbekistan on trans-frontier rivers, plan construction of hydroelectric power plants on their territories. It will greatly diminish availability of water for Uzbek lands between spring and autumn. Kyrgyz and Tajik politicians even consider proclaiming water a commodity i.e. charging Uzbekistan for it. As far as Tashkent is concerned, it will be a crying violation of international law and regional traditions. This conflict of interests peaked when the heads of Kazakhstan, Kyrgyzstan, and Tajikistan reached an agreement concerning water, gas, and fuel oil in Uzbekistan's absence in late 2008. Tashkent's retaliation was swift. Uzbekistan announced withdrawal from the Eurasian Economic Cooperation Organization, closed the border with Tajikistan, and upped gas tariffs for Tajik and Kyrgyz consumers. Part of the blame was pinned on Moscow which Uzbekistan had asked to become an arbiter and whose support it had sought in the dispute with the neighbors. Moscow had always accepted validity of Tashkent's arguments but remained neutral. The first changes in its stand on the matter became visible last year when Russia declared the plans to invest in construction of the Kambarata hydroelectric power plants in Kyrgyzstan. It set everything in motion. Uzbekistan knew that the Kambarata decision might be followed by Russia's consent to complete construction of the Rogun Hydroelectric Power Plant. Tajikistan had been going out of its way to convince Moscow to reanimate this project suspended since soon after disintegration of the Soviet Union. Completion of the Rogun Hydroelectric Power Plant could spell a catastrophe for Uzbek agriculture. It stands to reason to assume that there is more to the price Russia paid for Uzbekistan's return to the Caspian Project than higher gas tariffs. 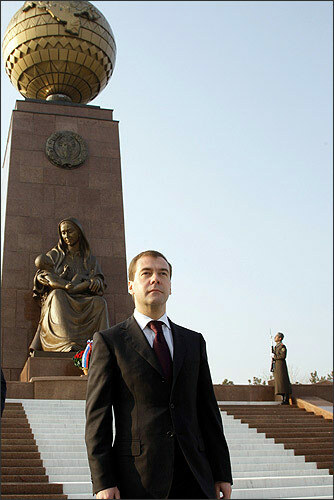 What Medvedev said at the press conference in Tashkent leaves the impression that Tashkent finally found allies in the Russian capital. The Russian president said that construction of hydroelectric power plants on trans-frontier rivers required consent of all involved countries, environment security of the objects to be built, observance of international law and bilateral documents signed with nearby countries. This is the gist of Uzbekistan's stand on the matter, one it reiterated in public more than once. If Moscow chose to be on Karimov's side of the fence indeed, then it might serve as a prologue to a dramatic revision of the whole Russian policy in the Central Asian region. Certain corrections of the already proclaimed decisions with regard to the Kambarata hydroelectric power plants might occur yet. By the way, this turn of events explains that the postponement of Kyrgyz President Kurmanbek Bakiyev's visit to Moscow has nothing to do with existence of the US AF base on the territory of this country and everything with Moscow's stand on one of the central issues of regional security. 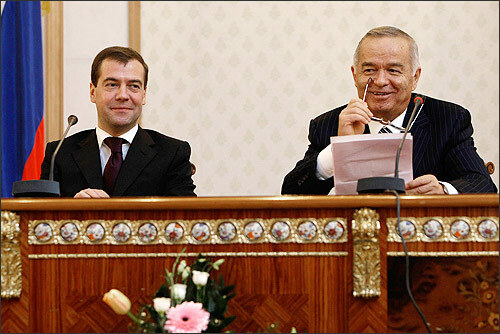 This is probably what Karimov meant when he was talking of the results of Medvedev's visit. "Very many things become clear now," he said. "It enables me to make decisions while being sure of Russia's position on key issues of regional security." Whether or not the so called "water" problem is really the price of the Caspian Project to be reanimated will become clear in the near future. All interested parties are expected at the summit of the CIS Collective Security Treaty Organization in Moscow in early February. Bakiyev's visit where the matter of Russian investments in the Kyrgyz power industry will be settled one way or another is scheduled for early February too.